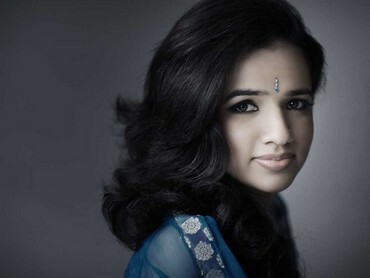 Bindu Subramaniam, daughter of legendary violinist L Subramaniam talks about the difficulties she faced in bringing out her debut English album, finding her voice and more. In a conference hall of a swanky new glass building, a small group has converged to launch a music album. A young 20-something girl with an American accent seems at the centre of all activity. In another corner a baby, not more than a few months old, makes her presence felt by crying out once in a while. For the most part, however, she is quiet and the young girl with the accent keeps turning to her. Somewhere in the middle of it all, a senior gentleman wearing a gold kurta sits patiently waiting for everyone to settle down. He is holding a tiny camera, which he gives up to take the baby. When his name is called out, L Subramaniam walks up to the dais with his granddaughter in his arms. His wife and singer Kavita Krishnamurthy sits on his right. The young girl takes the vacant seat on his left and listens intently to everyone's speeches -- most of which are about her solo debut music album. This is my first introduction to Bindu Subramaniam. 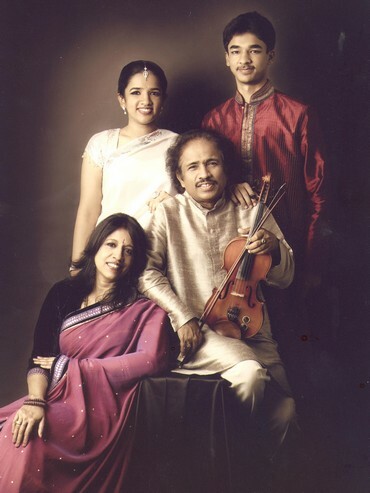 The daughter of the legendary violinist L Subramaniam, Bindu seems aware of the legacy she carries. 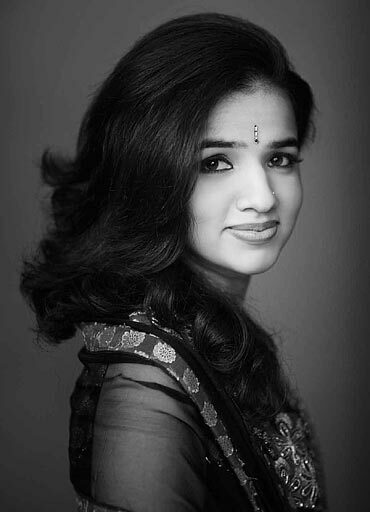 Her music, she knows, will be compared with that of her stepmother Kavita, just as her teenage brother Ambi's violin playing skills are compared to their father's. Bindu's album Surrender is a collection of ten tracks (of which one is a radio edit), all English. She tells me that it has been a challenge trying to get it out in the market, quite simply because most record labels didn't seem able to figure out where to place it! In an interview, Bindu talks about these challenges, why she dropped her original name Seetaa and more. What kind of musical influences would you say you've had? I love jazz, but since I have grown up in a household of music, my influences have been diverse. My father has collaborated with the greatest musicians across genres -- be it George Harrison or George Duke or Stanley Clarke. Besides these, he also collaborated with a lot of Indian musicians. So I had the opportunity to see them perform and sometimes perform with them. Musically, I do have a lot of jazz influences and Ella Fitzgerald to me is the epitome of what a voice should be. I happened to watch one of her videos at the Montreal Jazz Festival and the way she just holds the mike and sings -- she might be taking a walk down the street -- makes you look at her in awe! I've learnt a lot about perfection from people like her. I am nowhere near being perfect, but it helps to set the bar high for oneself and keep working towards achieving (those high standards and) creating one's own sound rather than being Ella Fitzgerald, Kavita Krishnamurthy or Lata Mangeshkar. Was it difficult to find your voice, more so considering you are surrounded by so many musical greats? For a long time I was trying to be what people expected of me -- the daughter of the greatest violin player in the world, with a Bollywood background as well. People would ask me, 'So are you doing Carnatic or Bollywood?' And in the beginning it was uncomfortable. But I've been lucky because where I come from everyone has been open (about what genre of music one can choose to play). My brother Ambi does Western classical, Carnatic and fusion. My other brother Narayana does ghazals and writes poetry. At some point I realised I am not doing music for other people to listen to. Obviously I want people to listen to it and like it, but if that or to make people happy is the main intention, then I won't be honest to myself; somehow, that comes through in the music I feel. When would you say you found your voice amidst so much (rhythmic) clutter? I think I wrote my first song when I was seven. It was quite pathetic (laughs), it was a rip off of Michael Jackson's Heal the World that we would sing during our lessons in school. You don't write about grandchildren when you are seven, so the vibe was obviously Michael Jackson. Later, when I was almost at the end of my law degree, I asked myself what direction I was going to take. At that point, I sat down and said I don't care what anyone says, this feels right and (since) I have the support of my family, this is what I will be doing. While listening to (one of your tracks in the album) Autumn Leaves, I couldn't miss references to musicians like Simon and Garfunkel and Frank Sinatra. Do you listen to them a lot? Yes I do! I feel no one in the world can pronounce words better than Frank Sinatra. And Ma (Kavita Krishnamurthy) is strict about pronunciations. She would come into the studio and ask me what a particular word was and I'd say 'You know that word!' and she would say it isn't clear. So (unlike) in a lot of popular music where enunciation isn't important, we were made conscious of it. Besides, as a lyricist and singer, enunciation was always important to me and I would make sure that the words were correct. That was something I tried to imbibe from Frank Sinatra -- if you listen to him, you'll see he always got the words right, irrespective of whether he would sing in high or low pitch. I read somewhere that to get the breathing right he used to swim for two hours. Ditto for Ella Fitzgerald, whose voice production is just so pure. That's another thing I tried to focus on -- the production of the voice, making sure it is honest. For Autumn Leaves, I was also sure I wanted an acoustic base. So we recorded the piano and the bass for the track in Poland. I also wanted a pure jazz approach to contrast with the Indian stuff we were doing with the song otherwise. It strikes me now, that even though you have a strong American accent while speaking, you don't have an accent while you sing. Why is that? I was born in the US but shifted to India when I was in the sixth grade. I guess when you're trying to fit in you try to neutralise your accent. If you have a strong American accent (in India), you start getting judged based on that and it becomes the first thing people notice about you. When I sing, I try to make the words as clear as possible and try not to think what accent I have. So is it a conscious effort? Not really. Now that you said it, you've stumped me a little. Maybe I should think about that (laughs). Yes! I do have the unquestioned benefit (of coming from an influential family), but in other ways it is very challenging because people automatically expect you to be of a certain calibre. In that respect, we (star kids) have to work doubly hard. 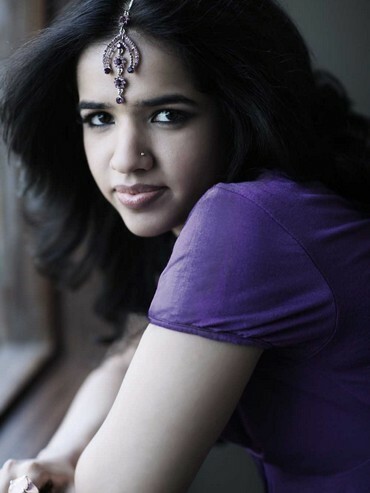 I won't be compared to other musicians who are just starting off; I am automatically compared to (let's say) someone like Kavita Krishnamurthy. (No one will consider that) I haven't put in 40 years of hard work. Ambi, for instance is always put up against my dad, which is intensely unfair. You won't compare him with another 16 or 18-year-old, you just compare him with his dad and perhaps say, 'Yes, he plays fast but is he as good as his dad?' So it is hard! When did you record the album? Well, it's taken about two years to get the album out, because it is quite a challenge to bring out an English album in India, surprisingly. If you think about it, we speak in English, we listen to a lot of international English music, we read English books, we even read English books by Indian authors! But for some reason it is still a challenge to say this is an English album by an Indian singer. People would just ask me, 'Why don't you make a Hindi album?' And I find that such a strange question! What kind of response did you get from the record labels? Record labels have to have a slot. If it is a CD, they need to know what rack it will go into. For them 'International' is one rack, 'Hindi' is another. In the midst of all this, where does Indian-English fit in? Even with radio stations -- you have those that play Hindi songs or those that play English. Those that play English play Shakira, Britney Spears, Linkin Park and the like. So where do I fit in? At one point, we just let it go and said if enough people hear it and like it, then we have done what we needed to. Correct me if I am wrong: record labels in India turned down L Subramaniam's daughter because they didn't know where to slot her? I wouldn't say turned down. I didn't get overwhelming support. (Record labels would say) 'We can print it and put it on shelves but we don't know what we can really do.' Besides, being L Subramaniam's daughter didn't help because music has to stand for itself (laughs). People would tell me that they enjoyed listening to the album and the songs but no one knew how they'd market it! Times Music, on the other hand, wasn't scared. They said, 'We'll put it out and we can get people to listen to it and we're sure people would listen to it.' So that kind of positive outlook helped. As a debutante, is it a serious concern to know how your first album will be promoted? I just want to make sure that people want to hear it. It will be sad if after two-and-a-half-years of hard work, it doesn't do well not because it is not good, or because people think it is not good, but because people haven't heard it. There are hundreds of albums that come out every day that people don't hear and the stuff that comes out is the stuff that has the most backing. And that in turn influences everything. If you're not able to create and if you are only able to do something through movies, that narrows everything down and it becomes a cycle after that. The only music that comes to the front is the music that people believe will be popular and because of that, that's the only kind of music that is made and effectively, it is also the only thing that will get pushed again. So in that sense, yes it is a bit of a concern, but as Luke Kenny put it a little while ago (while launching the album) it is time for people to have the courage to put things out. Hopefully with the Internet, Facebook and Twitter you don't really need a giant company behind you to push you -- at least that is the hope. When and how did Berklee come about? He believes that everyone has to be overeducated. So after I completed my law degree I had to look at doing a master's degree. I was looking at LLM, which I am pursuing right now. Meanwhile I was also keen on doing something in music. So I started working on a master's degree in songwriting and the music business from the Berklee School of Music. Studying at Berklee was a great learning experience. They have an international student base, so it was interesting to interact with people from various cultures. I also did some of their online courses, where I met a lot of interesting people too -- most of them keep their day jobs and pursue music as a passion. One of them I know is a software engineer; the other runs a superb sandwich place! So where did you complete your law degree from? My father's only condition was whatever I did, I had to get a higher first class in law, which I did so it was fine! Tell us something about growing up in a maestro's house? I have to say I had a very normal childhood, except for the fact that my father would travel very often. He didn't return home every night like most fathers did, because he'd be travelling. How did you cope with the loss of a mother? I was about 10 when she died. It was difficult, but I suppose at that age you internalise a lot. It does come up in bits later in life, but having a strong family, we went through it together as a unit. There's always the tendency to be strong for the other person and that takes us through. So watching my younger brothers grow up and handle it, I learned to handle it too. Tell us something about your husband, Premsai. He is an MBA and into logistics. It is a fresh change to have someone who isn't from our field. It balances out, otherwise everyone else in the family has something to do with music. And then there are lawyers, who are very different. We have a good thing going -- we don't interfere in each other's space and respect what we do. So where is he right now? He is working shifting cargo (laughs). Has he heard the first album? What does he have to say? Well, it was recorded before we met, so he wasn't really part of the creative process. But yes, he has heard it and he's liked it. Was it an arranged marriage? We are very attached to the Shankaracharya of the Kanchi Mutt and I believe a lot in him. In fact, I even changed my name from Seetaa Subramaniam to Bindu because he said so. It may be a coincidence, but my life has gotten better since. It was about three years ago. If you have faith and earn the faith, after a point you shouldn't question it. Of course, I resisted it initially, but it worked. It's nice to have someone to put your faith in. That has given me a great deal of stability. What kind of stability? Could you please explain? Well, let's just say I found myself. At one point I stopped contemplating the direction my life would take and decided to go with what was most honest. I let my degree in law take a backseat and focus on music. Personally too, I was going through a difficult situation. If I am not being too nosey, what kind of difficult situation was it? Sometimes you find yourself in a relationship and you question if it is the right thing. It (the Shankaracharya's advice) gave me clarity -- what to continue with and what not to. Are you part of the gig circuit? Not really. I do have a set in my dad's fusion show. But I haven't been performing as much as I used to earlier (because of the baby). Do you attend a lot of live gigs? Which bands on the alternative music scene in India do you listen to and like? Well, it's been a little restricted lately but because of Facebook I am in touch with a lot of musicians (active in the alternative music scene). There's Mili Nair, who is into jazz and does bit of work in ads too, who I like and I also love Rohan Soloman, who is the frontman for this (Delhi-based) band called Cyanide. In this album, I've also had the opportunity to work with Kurt Peters, who's a drummer and Gino Banks (son of Louis Banks). Then there are bands like Euphoria and Pentagram who have performed at the (Lakshminarayana) Global Music Festival that I quite enjoy listening to. Now that you are a mother of one, how do you see your career shaping up? I suppose it will be just a matter of packing an extra bag for her! Are you working on the next album? Yes! I have short-listed songs for the second album and I know what direction the album will take, but I haven't started recording it. Finally, can you provide five tips for aspiring musicians? Only do it if you love it. You have to work really hard -- there is simply no way around it. Don't believe when people tell you it's already done; do it yourself! Try not to isolate yourself -- its great to be creative in a basement, but unless you mingle and listen to new music and sounds, you will be missing something important.